The goal of this protocol is to demonstrate an effective method to decellularize and decalcify mouse cochleae for utilization as scaffolds for tissue engineering applications. Neal, C. A., Nelson-Brantley, J. G., Detamore, M. S., Staecker, H., Mellott, A. J. A Protocol for Decellularizing Mouse Cochleae for Inner Ear Tissue Engineering. J. Vis. Exp. (131), e56523, doi:10.3791/56523 (2018). In mammals, mechanosensory hair cells that facilitate hearing lack the ability to regenerate, which has limited treatments for hearing loss. Current regenerative medicine strategies have focused on transplanting stem cells or genetic manipulation of surrounding support cells in the inner ear to encourage replacement of damaged stem cells to correct hearing loss. Yet, the extracellular matrix (ECM) may play a vital role in inducing and maintaining function of hair cells, and has not been well investigated. Using the cochlear ECM as a scaffold to grow adult stem cells may provide unique insights into how the composition and architecture of the extracellular environment aids cells in sustaining hearing function. Here we present a method for isolating and decellularizing cochleae from mice to use as scaffolds accepting perfused adult stem cells. In the current protocol, cochleae are isolated from euthanized mice, decellularized, and decalcified. Afterward, human Wharton's jelly cells (hWJCs) that were isolated from the umbilical cord were carefully perfused into each cochlea. The cochleae were used as bioreactors, and cells were cultured for 30 days before undergoing processing for analysis. Decellularized cochleae retained identifiable extracellular structures, but did not reveal the presence of cells or noticeable fragments of DNA. Cells perfused into the cochlea invaded most of the interior and exterior of the cochlea and grew without incident over a duration of 30 days. Thus, the current method can be used to study how cochlear ECM affects cell development and behavior. The cochlea is an intricate spiral structure found in the temporal bone. It is composed of an outer bony labyrinth and a concentric, inner membranous labyrinth1. The membranous labyrinth consists of three fluid spaces: Scala vestibuli, Scala media, and Scala tympani1. The scala media houses the sensory epithelium, which is composed of a multitude of cell types, but the sensory hair cells (HC), which transduce mechanical energy in sound waves to nerve impulses2, are of particular interest. Exposure to acoustic trauma3,4,5, medication6, disease7,8, and aging9 can all result in impaired auditory function via HC death. Hair cell loss in mammals is permanent, unlike avian HCs, which can regenerate after injury10. A variety of contemporary research efforts have sought to restore lost HCs, although the specific experimental approaches vary. Manipulation of gene expression in the sensory epithelium and implantation of stem cells differentiated outside the body are dominant approaches in the field, although induction methods that seek to differentiate stem cells into cochlear organoids have been attempted11,12,13. Each of these approaches is either reliant directly on stem cells, or the developmental cues used by stem cells; however, a second shared, and potentially critical, element is the ECM of the cochlea itself14,15. The ECM not only provides physical support for cells and tissue, which includes a surface for cell adhesion, proliferation, survival, and migration, but also plays critical roles in the development of HCs and the spiral ganglion15,16,17. Naturally occurring ECM provides inductive signals that may guide cell phenotype determination and/or cell adhesion, proliferation, and survival18. 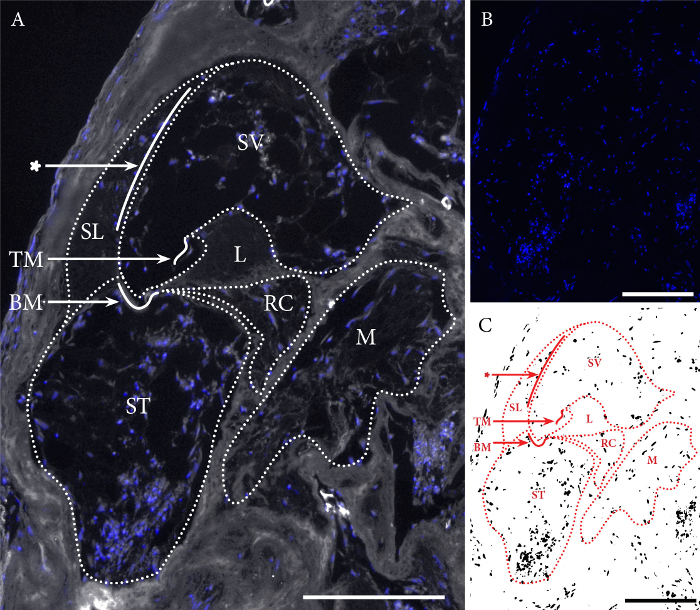 Consequently, the use of decellularized cochlea in combination with cultured hWJCs offer a unique opportunity to explore the role of the ECM and HC regeneration. HWJCs are a readily available, non-controversial cell type isolated from human umbilical cords that behave like mesenchymal stem cells19. HWJCs have shown the ability to differentiate down neurosensory cell lineages20,21. 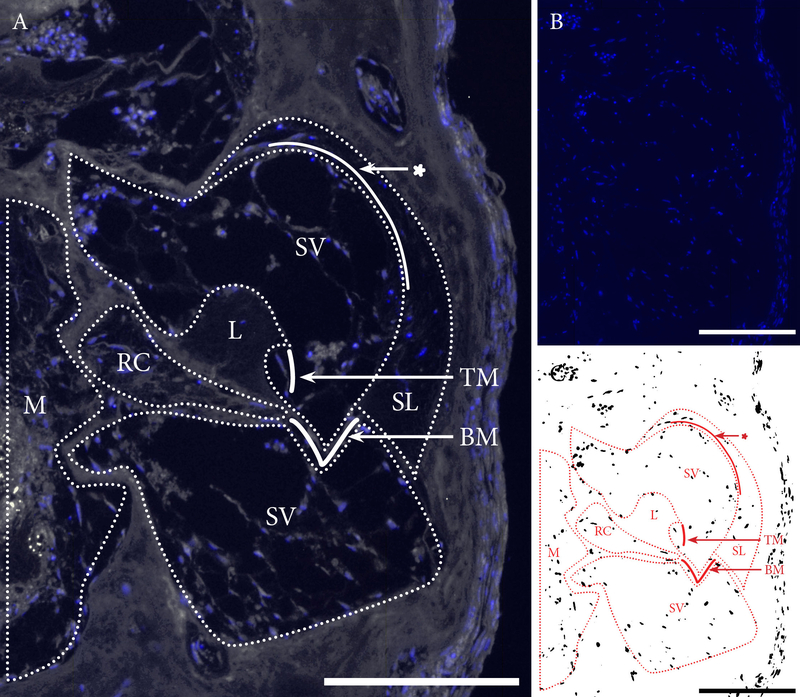 Thus, the current protocol details the isolation, decellularization, and perfusion of cochleae from C57BL mouse carcasses with hWJCs for inner ear tissue engineering. All procedures, including animal euthanasia, were conducted according to the approved Institutional Animal Care and Use Committee (IACUC) protocol (ACUP #2014-2234) at the University of Kansas Medical Center (KUMC). NOTE: HWJCs were isolated from human umbilical cords that were donated by patients that provided informed consent and specimens were used in accordance with the protocols approved by the University of Kansas Human Subjects Committee (KU-IRB #15402). Decapitate an appropriately euthanized, 15-week-old mouse by cutting between the skull and first cervical vertebra with a sharp pair of surgical scissors, then spray down the head with 70% ethanol to disinfect (Figure 1A). Bisect the skull in a mid-sagittal plane using the same sharp pair of surgical scissors (Figure 1B-C, dashed lines). Remove the brain tissue from the skull using a pair of forceps (Figure 1D, arrowhead). Identify the temporal bone through the presence of the auditory and vestibular nerve roots (Figure 1E-F, arrowheads) on the interior of the skull and the ear canal from the exterior (Figure 1F, arrow). Carefully cut through the skull to isolate the temporal bone from the remainder of the skull (Figure 1G). NOTE: In some instances, it may be possible to delicately pry the surrounding bones of the skull away from the temporal bone without requiring cutting. Insert the fine forceps into the opening of the ear canal approximately 5 mm (Figure 1H), so the tips do not risk puncturing the cochlea. Gently break open the bone of the bulla (Figure 1H, top red shaded area) so it fractures (Figure 1I, red dotted line). NOTE: If necessary, a dissection microscope may aid in this process to ensure accurate placement and manipulation of instruments. Using fine forceps, pry away the remainder of the bulla from the temporal bone, exposing the bony labyrinth of the cochlea (Figure 1J, red brackets). Place a Petri dish large enough to hold the temporal bone (e.g., 30 mm or greater) underneath the dissecting scope field of view and fill it with enough Phosphate Buffered Saline (PBS) to cover the temporal bone (e.g., 0.5 to 1 mL). Submerge the temporal bone with the bulla removed in the PBS with the oval and round windows of the cochlea facing up. NOTE: Removal of the vestibular system from the cochlea is not necessary, as the vestibular system serves well as a handle for manipulating and orienting features of the cochlea (Figure 1I and Figure 2B). Using an ultra-fine pair of forceps, remove the stapedial artery, which passes through the stapes. Insert one tip of the ultra-fine forceps through the arch of the stapes where the artery passed through, and delicately lift the stapes upward. The disarticulated stapes should lift off of the oval window. Using one tip of the ultra-fine forceps, puncture the oval and round windows. Using a 1x PBS filled 28.5-gauge syringe with tubing (inner diameter 0.28 mm, outer diameter 0.61 mm) attached, position the tubing over the oval window (Figure 2A - B). NOTE: The opening of the tube can be manipulated using ultra-fine forceps helping to ensure accurate placement. Use a fresh syringe and tubing for each cochlea. Perfuse 2 mL of 10% antibiotic-antimycotic (anti-anti) and 10% penicillin-streptomycin (pen-strep) in PBS through the cochlea over 5 min to remove the perilymph. Perfusing too fast with too much pressure will damage the fine structures within the cochlea. NOTE: Manually driving the syringe by hand to perfuse the fluid through the cochlea is effective, although a perfusion pump could be used as an alternative. If manually perfusing, use a pair of fine, self-closing forceps to stabilize the cochlea (Figure 2A) during perfusion by grasping the vestibular portion of the temporal bone. NOTE: Although not required, this leaves both hands free to handle instruments; one hand can drive the syringe (Figure 2A) while the other can position the tubing appropriately (Figure 2B). From this step forward, take care to avoid exposing the cochlea unnecessarily to air. Introducing air bubbles into the fluid spaces will block fluid circulation, and further drying out will damage the fine structures within the cochlea. Remove and discard any remaining muscle tissue and bone fragments using fine forceps. If necessary, store isolated cochleae at 4 °C in 10% anti-anti and 10% pen-strep solution in PBS for up to seven days with regular changes of antibiotic solution every 48 h.
For each cochlea, fill a 20-mL glass scintillation vial with a 1% sodium dodecyl sulfate (SDS) solution in de-ionized (DI) water, which is used to decellularize the cochlea. Cut the tip off of a plastic 7-mL transfer pipette using a razor blade so that the opening is large enough for a cochlea to pass through. Using the transfer pipette, gently draw the cochlea up into the pipette so it just passes the cut-off edge by a few millimeters. Expel the cochlea into the 1% SDS solution-filled scintillation vial. Circulate 2 mL of 1% SDS in de-ionized (DI) water through the cochlea in the scintillation vial using a transfer pipette. Place the scintillation vial into a rotator, and allow the scintillation vial to rotate at 10 rpm for 72 h at room temperature. Change 1% SDS solution every 24 h over a 72 h period. Take care when changing SDS to never expose the cochlea to air. Wash the cochlea three times for 30 min each with DI water. Perform the washes in the same scintillation vial used for the SDS charges; at this stage, the cochlea is decellularized. Remove the remaining DI water from the scintillation vial, leaving just enough to keep the cochlea submerged. To begin decalcification, add 5 mL of 10% ethylenediaminetetraacetic acid (EDTA) (0.02 M) in DI water to the scintillation vial containing the cochlea. Circulate 2 mL of 10% EDTA in DI water through the cochlea in the scintillation vial using a transfer pipette. Place the scintillation vial back in the rotator, and allow the scintillation vial to rotate at 10 rpm for 72 h at room temperature. Change the 10% EDTA solution every 24 h over a 72 h period. Take care when changing solutions so that the cochlea is not exposed to air. Rinse the cochlea 3 times for 2 h each with 1x PBS; at this stage, the cochlea is decalcified. Store the cochleae for up to 72 h in a 10% anti-anti, 10% pen-strep solution in PBS at 4 °C. NOTE: Longer storage periods may be possible with regular changes of antibiotic solution; however, extended storage of processed cochleae has not been validated in this protocol. Isolate hWJCs according to previously published protocols22. Briefly, segment umbilical cords into 3-cm sections. Carefully make a shallow incision with a scalpel lengthwise on each umbilical cord segment to unroll and expose the Wharton's jelly of the umbilical cord. Use forceps to remove the blood vessels. Wash umbilical cord segments twice with enough PBS (e.g., 40 mL in a 60 mm Petri dish) to submerge the tissue. Finely mince tissue segments with a scalpel. Digest tissue in a 100 mm Petri dish with 50 mL of digestion medium (0.2% type 2 collagenase, 1% penicillin-streptomycin, in low-glucose Dulbecco's Modified Eagle's Medium (DMEM)). Place tissue in digesting medium on an orbital shaker at 50 rpm overnight in a 5% CO2, 37 °C incubator. The following day, dilute digestion medium at a ratio of 1:16 in 2% antibiotic-antimycotic in PBS, and pellet cells by centrifugation at 500 x g at room temperature (~ 27 °C) for 10 min. Discard supernatant. Resuspend pellets in Mesenchymal Stem Cell Growth Medium (MSCGM) and recombine cells. Plate cells at a density of 7 x 103 cells/cm2 in tissue culture treated T-75 flasks. Culture HWJCs in MSCGM, and expand to passage 5 for experiments. NOTE: HWJCs may be sub-cultured into larger T-flasks (e.g., T-150, T-300) when passaging to increase yield of hWJCs for experiments. Using aseptic technique, wash stored cochleae in 1x PBS three times for 30 min each. Transfer cochleae into separate wells of a 24-well plate, and add 1 mL of 37 °C pre-warmed MSCGM. Incubate cochleae in a 5% CO2, 37 °C cell culture incubator for a minimum of 1 h before infusion of cells. Wash hWJCs with 37 °C pre-warmed 1x PBS twice. Add enough 37 °C pre-warmed Trypsin with 0.5% EDTA to cover the cell vessel surface. Incubate hWJCs for up to 5 min in a 5% CO2, 37 °C cell culture incubator. Verify that 90% of cells have detached from the cell culture surface by viewing cells under an inverted microscope. NOTE: Cells that move when the culture vessel is gently tapped, have detached. Cells that remain stationary, have not detached. Gently tap the sides of the flask to further dislodge attached cells. Using aseptic technique, transfer hWJCs from the culture vessel to a 50-mL conical tube containing an equivalent volume of MSCGM to the volume of Trypsin used to dissociate the cells. Pellet the hWJCs by centrifuging at 500 x g at room temperature (~ 27 °C) for 5 min. Aspirate supernatant, and resuspend hWJCs in MSCGM at a concentration of 500,000 cells/mL. Transfer cochleae to a new 24-well plate using a transfer pipette. Add a drop of MSCGM to each cochlea to prevent any cochlea from drying out. Delicately orient the cochlea using ultra-fine forceps so that the oval and round windows are facing up. NOTE: Take extreme care when directly handling each cochlea as the cochlea is easily damaged. Using a sterile 28.5-gauge insulin syringe with connected tubing, draw up 0.2 mL resuspended hWJCs (100,000 cells). Using sterilized fine forceps, position tubing over the oval window. Delicately and slowly perfuse the cochlea with 0.2 mL of resuspended hWJCs using a 28.5-gauge insulin syringe connected to polyethylene tubing (Outer Diameter: 0.61 mm, Inner Diameter: 0.28 mm) over approximately 5 min. After perfusion, add 0.8 mL of 37 °C pre-warmed MSCGM to the well containing the cochlea to bring the total volume in the well to 1 mL. Repeat steps 4.3.3-4.3.7 for each cochlea, using a fresh syringe and tubing each time. Place perfused cochleae in a 5% CO2, 37 °C cell culture incubator, and change media three times per week. NOTE: Cochleae may be cultured and harvested at any time point up to 30 days post-perfusion. To preserve cochleae, fix in 4% paraformaldehyde in 1x PBS overnight at 4 °C on a rocking platform. After fixation, wash cochleae with 1x PBS three times for 5 min each. Gradually dehydrate cochlea with ethanol and clear with an aliphatic hydrocarbon solvent before embedding in paraffin. Section samples to a thickness of 10 µm using a microtome and mount on glass microscope slides. NOTE: Samples are now ready for histological or immunohistochemical processing using standard protocols. Using the methods presented here, successful decellularization of cochleae was assessed by examining the presence or absence of DNA through 4',6-diamidino-2-phenylindole (DAPI) staining. Cochleae were considered fully decellularized if DNA was not identified within the decellularized cochlea. A native cochlea from a previous experiment that did not undergo decellularization or decalcification was used as a positive control to illustrate the structures and cells traditionally found in a C57BL mouse cochlea. The decellularized-decalcified cochlea, which did not have any hWJCs infused, was used as a negative control. No quantifiable DAPI stained cell nuclei were observed in any region of the tissue section (Figure 3). Two cochleae were decellularized and decalcified, and then infused with hWJCs for the current project. The decellularized-decalcified cochleae that were perfused with hWJCs were observed to have numerous DAPI stained nuclei within the cochlea and growing on the bony shell outside of the cochlea (Table 1). Total estimated cell densities for the cell infused first cochlea were 113,759 cells/cochlea after 30 days of culture (Figure 4 and Figure 5) and for the second cochlea were 118,732 cells/cochlea after 30 days of culture (Figure 6 and Figure 7). These cell density estimates include the Scala tympani, Scala media, and Scala vestibule, and volumes of the structures found within the three fluid spaces, but these estimates excluded any of the remaining bony labyrinth. In addition, samples from each cochlea were stained with Hematoxylin and Eosin (H&E) to show the presence of cells and anatomical features within each cochlea (Figure 8). The gross anatomy of the cochlear microstructures remained predominantly unchanged throughout all stained sections; however, no cells were identifiable in the decellularized-decalcified section (Figure 8B). 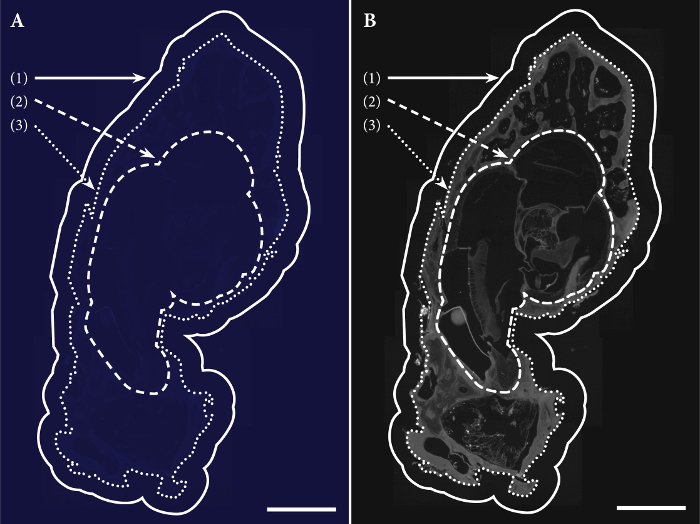 The identification of cell nuclei was dramatically different between the native cochlea (Figure 8A) and the decellularized-decalcified cochleae infused with cells (Figure 8C-D). Figure 1: Mouse temporal bone isolation. Once the mouse has been appropriately euthanized, decapitate the animal by cutting between the base of the skull and the first cervical vertebra, and spray the head with ethanol to disinfect (A). Bisect the skull in a sagittal plane of section (B-C) using a sharp pair of surgical scissors, cutting through both the brain tissue and bone. 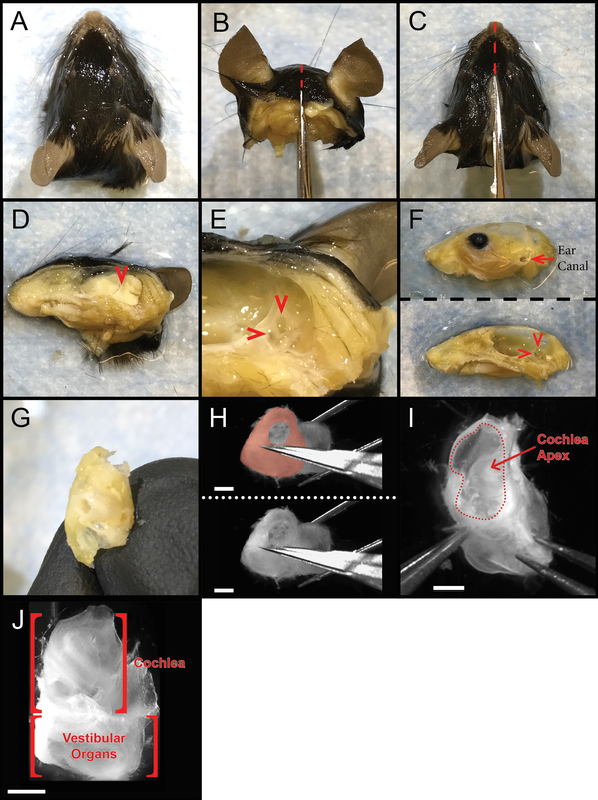 The bisected mouse head (D, lower mandible removed for unrelated experimental work) must then have the brain tissue removed to reveal the temporal bone. The two foramina through which the auditory and vestibular nerves pass (E, red arrowheads) are useful cues for successfully identifying the temporal bone. Remove the flesh from the skull (F). The external ear canal (F, arrow, top panel) provides a useful external cue as well. Carefully trim away the excess bone, leaving just the isolated temporal bone (G). The bulla (H, top panel, red highlighted area) must then be delicately removed using fine forceps (H, lower panel). The bulla is thin bone and can be readily chipped away (I) until the bony labyrinth of the cochlea is revealed (J, red brackets). Scale bars on all images are 1 mm. Please click here to view a larger version of this figure. Figure 2: Cochlear Perfusion. Once the temporal bone has been isolated and the bulla has been removed, the cochlea can then be set up for perfusion at a microscope. When perfusing using a manually driven syringe with tubing attached (A, dotted line) it may be helpful to stabilize the cochlea using a pair of self-closing forceps. Gently attach the forceps to the vestibular part of the temporal bone (B) and rest the forceps against the lip of the Petri dish (A). This leaves both hands free to manipulate instruments during perfusion. One hand can then manipulate the syringe, controlling the flow rate of the fluid, while the other hand can position the tubing over the oval window using a second pair of forceps (B). Cutting the free end of the tubing at an angle allows for easier positioning, allowing the tubing to be placed correctly without blocking the field of view. Scale bar is 1 mm. Please click here to view a larger version of this figure. Figure 3: Tissue section of a decellularized mouse cochlea. An upright epi-fluorescent microscope was used to image samples at a magnification of 200X (10X eyepiece and 20X objective). Images were stitched together to create approximately a 4 x 5 montage. DAPI nuclear staining showing absence of cells is shown in panel A using a DAPI common filter set (350 nm excitation, 470 nm emission), and an overexposed, grayscale image of the autofluorescence using a fluorescein isothiocyanate (FITC) common filter set (490 nm excitation, 525 nm emission), which provides anatomical landmarks, is shown in panel B. Automated cell counts were performed in three regions of interest, which are delineated on both panels A and B. Total cell counts were calculated for the entire tissue section (1, solid white line) and the cochlea (2, dashed line). These two numbers were used to calculate the number of cells in the bony structures outside of the cochlea but within the exterior, bony edges of the tissue section (3, space between the dotted line and dashed line). Scale bars on all images are 500 µm. Please click here to view a larger version of this figure. Figure 4: A near-modiolar section of decellularized mouse cochlea 1 infused with hWJCs. DAPI nuclear staining is shown in panel A overlaid onto an overexposed, grayscale autofluorescence from the green channel, which provides anatomical landmarks. Automated cell counts were performed in three regions of interest, which are delineated in panel A. Total cell counts were calculated for the entire tissue section (1, solid white line) and the cochlea (2, dashed line). These two numbers were used to calculate the number of cells in the bony structures outside of the cochlea but within the exterior, bony edges of the tissue section (3, space between the dotted line and dashed line). Isolated DAPI staining is shown in panel B, and the threshold of the DAPI staining used during automated quantification is shown in panel C. Scale bars on all images are 500 µm. Please click here to view a larger version of this figure. Figure 5: High magnification view of a near-modiolar section of decellularized mouse cochlea 1 infused with hWJCs. DAPI nuclear staining is shown in panel A overlaid onto an overexposed, grayscale image of the autofluorescence from the green channel, which provides anatomical landmarks. Isolated DAPI staining is shown in panel B, and the threshold image used during automated cell counting is shown in panel C. The fluid spaces and finer microstructures housed within the cochlea are nicely preserved during the decellularization and cell culture phases of the experiment. Scala Vestibuli (SV), Scala Tympani (SM), Basilar Membrane (BM), Tectorial Membrane (TM), Spiral Limbus (L), Rosenthal's Canal (RC), Modiolus (M), Spiral Ligament (SL), and Stria Vascularis (*). Reissner's membrane was not clearly defined in tissue sections, and as a result the Scala Media was not clearly defined. Scale bars on all images are 250 µm. Please click here to view a larger version of this figure. Figure 6: A near-modiolar section of decellularized mouse cochlea 2 that was infused with hWJCs. DAPI nuclear staining is shown in panel A, overlaid onto grayscale autofluorescence from the green channel, which provides anatomical landmarks. Automated cell counts were performed in three regions of interest, which are delineated in panel A. Total cell counts were calculated for the entire tissue section (1, solid white line) and the cochlea (2, dashed line). These two numbers were used to calculate the number of cells in the bony structures outside of the cochlea but within the exterior, bony edges of the tissue section (3, space between the dotted line and dashed lines). Isolated DAPI staining is shown in panel B, and the threshold of the DAPI staining used during automated quantification is shown in panel C. Scale bars on all images are 500 µm. Please click here to view a larger version of this figure. Figure 7: High magnification view of a near-modiolar section of decellularized mouse cochlea 2 that was infused with hWJCs. DAPI nuclear staining is shown in panel A, overlaid onto grayscale autofluorescence from the green channel, which provides anatomical landmarks. 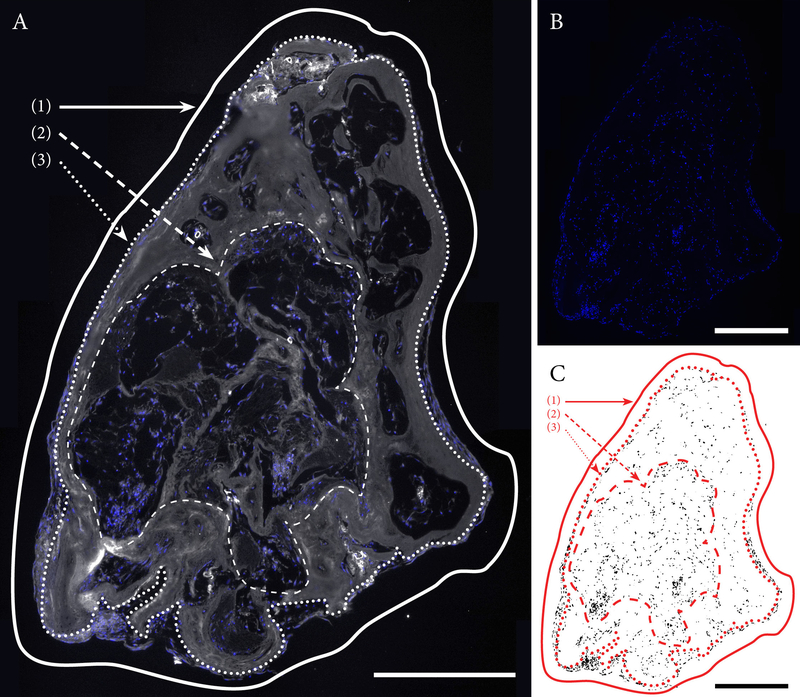 Isolated DAPI staining is shown in panel B, and the threshold image used during automated cell counting is shown in panel C. The fluid spaces and finer microstructures housed within the cochlear are preserved during the decellularization and cell culture phases of the experiment. Scala Vestibuli (SV), Scala Tympani (SM), Basilar Membrane (BM), Tectorial Membrane (TM), Spiral Limbus (L), Rosenthal's Canal (RC), Modiolus (M), Spiral Ligament (SL), and Stria Vascularis (*). Reissner's Membrane was not clearly defined in tissue sections, and as a result the Scala Media was not clearly defined. Scale bars on all images are 250 µm. Please click here to view a larger version of this figure. Figure 8: Hematoxylin and Eosin staining of control and treated cochleae. Hematoxylin and Eosin stained sections displaying a typical cochlea with native cells present is shown in panel A. Panel B contains the same structures as panel A, but is from a fully decellularized cochlea, which leaves behind the extracellular matrix. The two previously shown cochleae infused with hWJCs are seen in panels C and D. The gross cochlear anatomy remains predominantly unchanged through the decellularization and cell culture processes, although the specific cell populations and locations are dramatically altered. Scala Vestibuli (SV), Scala Tympani (SM), Basilar Membrane (BM), Tectorial Membrane (TM), Spiral Limbus (L), Rosenthal's Canal (RC), Modiolus (M), Spiral Ligament (SL), and Stria Vascularis (*). Scale bars on all images are 250 µm. Please click here to view a larger version of this figure. Table 1: Cell Counts. DAPI stained cochlear sections were thresholded and quantified using automatic counting tools in ImageJ in 3 non-overlapping regions of interest (outside the bony labyrinth, temporal bone outside of the cochlear fluid spaces, and within the cochlea). Cross-sectional cochlear area was also measured in ImageJ, and this value was used to calculate section volume in combination with section thickness (10 µm). Using an estimate of total cochlear volume published by Santi et al.23, the relative cochlear volume of a given section was calculated. The cell density of the entire cochlea was estimated using the relative cochlear volume of a given section in combination with the paired cell count. We have successfully demonstrated that native cochlear cells can be removed from the cochlea via a decellularization process, which allows for the use of the cochlea as an intricate, three-dimensional tissue scaffold. 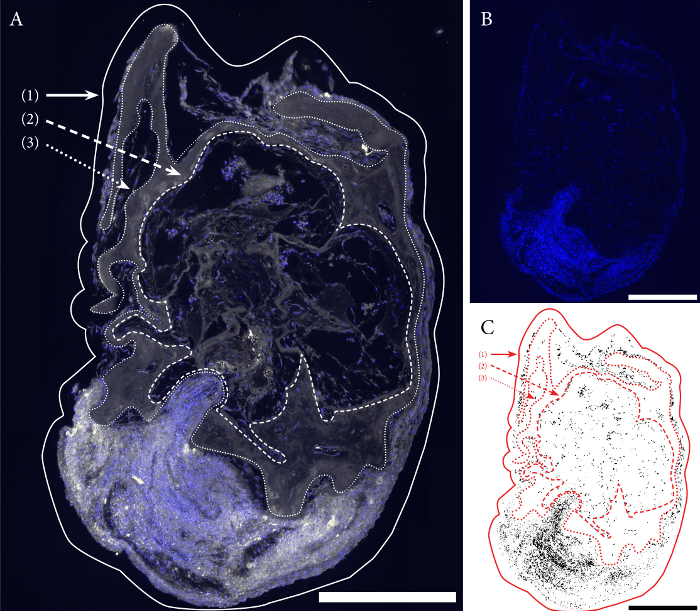 Santi et al.15 developed the initial method for decellularizing cochleae, and have accurately estimated the volumes of many cochlear structures through with the aid of light sheet microscopy23. 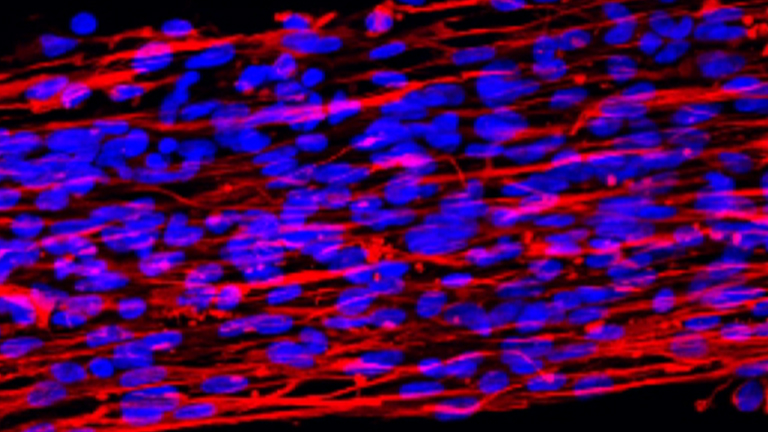 Such early work served as a strong basis for the tissue engineering and cell culture techniques presented here. Decellularized cochlea can successfully be infused with cells, and then cultured for a prolonged period of time. Cochleae from a wide array of animals could theoretically be utilized in combination with a similarly wide array of cells types. These combinations allow the techniques presented here to be utilized in numerous possible experimental designs, such as tissue engineering applications that examine sensory epithelium development14, drug testing of new pharmaceutical agents24, and development of cochlear repair models25. However, despite the broad applicability of these techniques they are not without limitations. One of the limitations of the current technique is that the perfusion is variable based on individual. Developing a holder, for the cochlea, and using a syringe pump to conduct perfusions may increase the accuracy and success of the process. Additionally, definitively proving successful decellularization could potentially be accomplished through several methods. We employed DAPI staining that was used to quantify remaining cell nuclei, and we observed no residual nuclei post-decellularization. Additionally, standard DNA quantification assays utilize the reagent, green dye detecting picogram quantities of DNA, to identify nucleic acid remnants, which may visually be more sensitive than DAPI for identifying the presence of small fragments of nucleic acids in decellularized tissues26. Regardless of which techniques are used to validate successful decellularization, it may not be possible to show complete decellularization of an individual cochlea prior to utilizing it as a scaffold. Nevertheless, we have found the decellularization process to be successful and robust. The two most critical steps in the current protocol are the isolation and handling of the cochleae, and the perfusion of the cochleae. Great care must be taken when the cochlea is initially isolated, as the cochlea is delicate and brittle. If too much force is applied while handling the cochlea with forceps, the cochlea could fragment. Thus, it is imperative to handle each cochlea gently before decellularization and decalcification. The vestibular system, if left intact, serves as a great handle for grabbing the inner ear complex with forceps, and orienting the cochlea. Similarly, when perfusing the cochlea with cells, the pressure behind the perfusion must not be too great, otherwise cells may not survive the perfusion. As noted in the current protocol, attaching tubing to the end of a 1-mL insulin syringe allows for easier handling of the cochlea with one hand, and greater precision in perfusing cells through the cochlea with the other hand. As a next step, it would be natural to assess developmental and functional markers to determine if the cochlear ECM is inducing differentiation of stem cells, and if so, which specific ECM components in the cochlea are inducing changes in cells. Perfusing different types of cells (e.g., stem cells, neuroprogenitors, fibroblasts, etc.) through the cochlea to monitor cell differentiation and behavior would be another fascinating follow-up investigation. In addition, cells that have been genetically modified or are exposed to a growth factor differentiation protocol may provide new insights into how the cochlear ECM supports neurosensory development, and possibly even function in hearing. Thus, the current protocol is a significant first step in using the cochlear ECM to study inner ear neurosensory development and maintenance, which may one day lead to the development of new therapies to restore hearing loss. The current project was funded by the University of Kansas Proof of Concept Fund. We would like to thank the nursing staff at KUMC (Kansas City, KS) for assisting us in obtaining human umbilical cords, and David Jorgensen for assisting with cochleae cultures. Raphael, Y., Altschuler, R. A. Structure and innervation of the cochlea. Brain Res Bull. 60, (5-6), 397-422 (2003). LeMasurier, M., Gillespie, P. G. Hair-Cell Mechanotransduction and Cochlear Amplification. Neuron. 48, (3), 403-415 (2005). Neal, C., et al. Hair cell counts in a rat model of sound damage: Effects of tissue preparation & identification of regions of hair cell loss. Hear Res. 328, 120-132 (2015). Ivory, R., Kane, R., Diaz, R. C. Noise-induced hearing loss: a recreational noise perspective. Curr Opin Otolaryngol Head Neck Surg. 22, (5), 394-398 (2014). Stucken, E. Z., Hong, R. S. Noise-induced hearing loss: an occupational medicine perspective. Curr Opin Otolaryngol Head Neck Surg. 22, (5), 388-393 (2014). Dille, M. F., et al. Tinnitus onset rates from chemotherapeutic agents and ototoxic antibiotics: results of a large prospective study. J Am Acad Audiol. 21, (6), 409-417 (2010). Sajjadi, H., Paparella, M. M. Meniere's disease. Lancet. 372, (9636), 406-414 (2008). House, J. W., Brackmann, D. E. Tinnitus: surgical treatment. Ciba Found Symp. 85, 204-216 (1981). Kujawa, S. G., Liberman, M. C. Acceleration of age-related hearing loss by early noise exposure: evidence of a misspent youth. J Neurosci. 26, (7), 2115-2123 (2006). Ryals, B. M., et al. Avian species differences in susceptibility to noise exposure. Hear Res. 131, (1-2), 71-88 (1999). Koehler, K. R., Mikosz, A. M., Molosh, A. I., Patel, D., Hashino, E. Generation of inner ear sensory epithelia from pluripotent stem cells in 3D culture. Nature. 500, (7461), 217-221 (2013). Sekiya, T., et al. Cell transplantation to the auditory nerve and cochlear duct. Exp Neurol. 198, (1), 12-24 (2006). Shi, F., Edge, A. S. Prospects for replacement of auditory neurons by stem cells. Hear Res. 297, 106-112 (2013). Mellott, A. J., Shinogle, H. E., Nelson-Brantley, J. G., Detamore, M. S., Staecker, H. Exploiting decellularized cochleae as scaffolds for inner ear tissue engineering. Stem Cell Res Ther. 8, (2017). Santi, P. A., Johnson, S. B. Decellularized ear tissues as scaffolds for stem cell differentiation. J Assoc Res Otolaryngol. 14, (1), 3-15 (2013). Davies, D., Holley, M. C. Differential expression of alpha 3 and alpha 6 integrins in the developing mouse inner ear. J Comp Neurol. 445, (2), 122-132 (2002). Gerchman, E., Hilfer, S. R., Brown, J. W. Involvement of extracellular matrix in the formation of the inner ear. Dev Dyn. 202, (4), 421-432 (1995). Goodyear, R. J., Richardson, G. P. Extracellular matrices associated with the apical surfaces of sensory epithelia in the inner ear: molecular and structural diversity. J Neurobiol. 53, (2), 212-227 (2002). Mellott, A. J., et al. Improving Viability and Transfection Efficiency with Human Umbilical Cord Wharton's Jelly Cells Through Use of a ROCK Inhibitor. Cell Reprogram. (2014). Mellott, A. J., Shinogle, H. E., Moore, D. S., Detamore, M. S. Fluorescent Photo-conversion: A second chance to label unique cells. Cell Mol Bioeng. 8, (1), 187-196 (2015). Mitchell, K. E., et al. Matrix cells from Wharton's jelly form neurons and glia. Stem Cells. 21, (1), 50-60 (2003). Mellott, A. J., et al. Nonviral Reprogramming of Human Wharton's Jelly Cells Reveals Differences Between ATOH1 Homologues. Tissue Eng Part A. 21, (11-12), 1795-1809 (2015). Buytaert, J. A., Johnson, S. B., Dierick, M., Salih, W. H., Santi, P. A. MicroCT versus sTSLIM 3D imaging of the mouse cochlea. J Histochem Cytochem. 61, (5), 382-395 (2013). Nonoyama, H., et al. Investigation of the ototoxicity of gadoteridol (ProHance) and gadodiamide (Omniscan) in mice. Acta Otolaryngol. 136, (11), 1091-1096 (2016). Dai, C., et al. Rhesus Cochlear and Vestibular Functions Are Preserved After Inner Ear Injection of Saline Volume Sufficient for Gene Therapy Delivery. J Assoc Res Otolaryngol. (2017). Sutherland, A. J., Converse, G. L., Hopkins, R. A., Detamore, M. S. The bioactivity of cartilage extracellular matrix in articular cartilage regeneration. Adv Healthc Mater. 4, (1), 29-39 (2015).